Myrtle Beach is a coastal city on the east coast in Horry County, South Carolina. It is situated on the center of a large and continuous stretch of beach known as the Grand Strand in northeastern South Carolina. Myrtle Beach is one of the major centers of tourism in the United States because of the city's warm subtropical climate and extensive beaches, attracting an estimated 14 million visitors each year. The area is home to numerous golf courses along the Grand Strand and further inland. 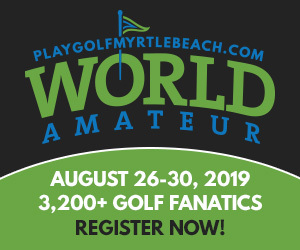 Myrtle Beach has been called the "Golf Capital of the World" because of the roughly 100 golf courses located there and record 4.2 million rounds played. The majority of the area's golf courses are public. The Grand Strand is home of "Hootie and the Blowfish Day After the Masters Tournament". Golfers around the world know about golf courses in Myrtle Beach, South Carolina. Many of the courses are designed by some of the world’s most renowned golf architects. You’ll find imposing oak trees, marshes, rivers, waterways and lakes. It is one thing to have challenging courses built for all skill levels of golfers. But it’s another to have these courses alongside beautiful scenery and serene wildlife; this is what South Carolina golf is all about.